The Stripe-throated Jery has 2 or 3 subspecies according to the authors. N.s. sclateri is found in NE Madagascar. This race has darker upperparts and heavier streaking on breast than nominate. N.s. striatigula (described above) is found in EC and SE Madagascar. N.s. pallidior occurs in SW Madagascar. This one has paler upperparts and more yellow on throat and breast. Distinct songs of nominate and the present races suggest that they could be treated as separate species. The Stripe-throated Jery occurs in or near the primary rainforest and in adjacent secondary growths in the E.
In SW, it occurs in mangroves and semi-arid coastal scrub, and also frequents the primary spiny forest. The Stripe-throated Jery gives quiet “tsiep” in E, becoming “tsick” or “tsilick” in W/S. The song in the E is an accelerating series of trilled buzzy notes, rising and falling in pitch “too-too twee-twee twee dree dree see see…see-see dree-dree-dree-dree-twee-twee-tcheechee”. This phrase is sometimes truncated. The Stripe-throated Jery feeds on insects taken from vegetation, foliage and twigs. The bird usually forages high in canopy in the rainforest. It often joins mixed-species flocks. The breeding behaviour is unknown, but the male can be seen singing from high bare treetop for long periods, probably to proclaim the territory. The Stripe-throated Jery is mostly resident on the island. The short, rounded wings only allow short-distance flights. The Stripe-throated Jery breeds between November and January, during the rainy season. It builds a ball-shaped nest suspended from one or some twigs about 1-2 metres above the ground in small bush. The flimsy structure has side-top entrance. It is made with grass, leaves and other vegetation. The nest materials are held together with spider webs and plant down. The outer part of the nest is decorated with dead leaves. Inside, the cup is lined with plant down. The female lays 3-5 eggs and probably incubates alone. No more information. However, most Cisticolidae species generally incubate during 12-15 days. The chicks are altricial at hatching and both parents feed them. The Stripe-throated Jery appears to be fairly common throughout most of range, although it is local and uncommon in SE (nominate race). This species could be affected by modification of the habitat, and the population trend is difficult to determine. But currently, the Stripe-throated Jery is not globally threatened and is evaluated as Least Concern. The Stripe-throated Jery is endemic to Madagascar where it occurs in E, S and SW of the island. It can be found in a wide range of woodland and forest habitats from sea-level up to 1,500/1,800 metres of elevation. It feeds on insects gleaned from the vegetation. 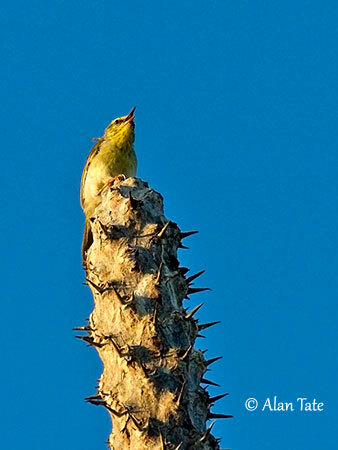 This species is often seen singing on exposed perches to proclaim the territory. The Stripe-throated Jery has very large range and it is usually fairly common. The species is not currently threatened. The Stripe-throated Jery of nominate race has olive-green upperparts, but nape and upper back are tinged grey. On the upperwings, the flight-feathers are darker with narrow, pale yellowish edges. The tail is dark olive-green. The underparts are whitish-grey, including chin and throat. There are yellow wash and variable olive streaking on throat and breast. The head is dull olive-green with pale supercilium extending from bill base to well behind the eye. We can see a conspicuous blackish eye stripe. Ear-coverts are pale greyish-green. The slightly decurved bill is blackish. The eyes are brown. Legs and feet are mid-brown to brownish-horn. Male and female are similar. The juvenile is currently undescribed.